Regardless of the economic climate, the financial sector is one that is continually evolving - technology improves, regulations increase - but opportunities always exist. 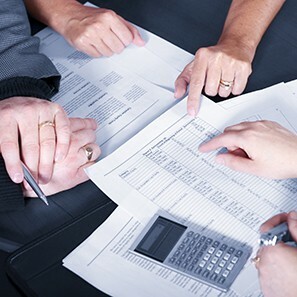 With extensive experience working with financial institutions, insurance companies, commercial finance companies and other institutions involved in the lending and borrowing of capital, the Finance Group is uniquely qualified to help clients navigate the challenges and opportunities they face. We have also handled numerous letter-of-credit based and secured loans, loan modifications, loan syndications and participations representing lead lenders, co-lenders and participants in large corporate, real estate, asset-based and middle market financing matters. We have extensive experience in financing of the purchase and sale of businesses and the purchase and sale of real estate, commercial leasing, entity formation and governance, title insurance coverage and claims, leasing, land development approvals and other entitlements, and condominium and other community associations. Our experience in these, and other areas, is often needed to effectively represent our financial institution clients and to help get the transaction done. The hallmark of our practice is the close working relationship we have established with clients and our individualized attention to each of them. We approach each matter as a team, involving partners, associates and staff, and work with all levels of each client’s internal organization. The team’s depth enables us to handle matters expeditiously and efficiently without sacrificing attention to detail. We understand the issues, very often from prior transactions with the borrower parties and opposing counsels, but most importantly, we know our clients, how they underwrite, document and administer their loans. We value the long-standing relationships we have built with our clients. As a result, we have been called on to help formulate internal policies and procedures. We have also played an integral part in helping our clients develop their training programs and often conduct workshops and seminars for them on various subjects in the finance arena. Our clients rely on us, not only as lawyers documenting a complex transaction, but as advisors on structuring deals and as experienced problem solvers when new or unexpected issues arise. We pride ourselves on our ability to think creatively, to work effectively with opposing counsel and to implement win-win situations for clients in difficult transactions. When needed, we call on lawyers in the firm's various practice groups to provide counsel in other matters, including entity formation and governance, mergers and acquisitions, commercial litigation, creditors’ rights and bankruptcy, taxation, trust and probate law, environmental law, insurance underwriting, claims and coverage, intellectual property, white collar crime, international law and securities. We represent borrowers, lenders and other credit sources on a national, regional and local basis in all aspects of complex commercial finance matters. We routinely handle a variety of commercial finance transactions, including leveraged buy-outs and roll-up financings, cash flow and asset based financing, second lien and mezzanine financing, acquisition financing and construction and development financing. Our lawyers are involved in all aspects of a transaction from structuring the credit, identifying the applicable borrower and guarantor parties, addressing various types of collateral and perfection methodologies, in addition to negotiating, documenting and closing the transaction. We understand the uniqueness and importance of each matter to our clients and strive to provide our clients with creative solutions, the highest quality work product, and a timely and cost-effective engagement. We have been providing comprehensive legal services tailored to the needs of our lender and developer clients in this niche market for over 25 years. We routinely represent leading industry lenders in financing the acquisition, development and construction of resort and mixed-use timeshare, condominium and hotel projects in locations throughout the United States, including the financing of amenities related to those projects, such as golf courses, water parks and clubhouses, and the development of residential lots surrounding the projects. These transactions often involve receivables loan financing or the purchase of pools of consumer loans extended to timeshare, fractional interest and condominium owners for new and existing projects, as well as fee based service arrangements with nationally recognized hotel and resort companies. We also represent developers in the creation of resort projects and have advised them on land use requirements and compliance, environmental matters, as well as consumer protection laws. We represent our clients not only during good economic times, but also during challenging times. Our attorneys handle the work out of defaulted loans, the sale of loans and other transactions to enable lenders to mitigate their risks and reduce their exposure. These matters involve forbearance arrangements, foreclosures, liquidations, bankruptcies and debt restructures. We have extensive experience litigating and trying complex commercial matters related to all aspects of a financial institution’s business. We have tried numerous jury and non-jury cases in state and federal courts throughout the country, as well as complex commercial arbitration matters. Our trial skills, coupled with our willingness and ability to try matters to a verdict, enable us to zealously advocate our client’s positions and obtain favorable results. We also have extensive experience with mediations and other modes of alternative dispute resolution. REGULATION B UPDATE: Can a Spousal Guarantor Invoke its Protections? Regulation B: Who can Invoke its Protections? Pennsylvania Mechanics’ Lien “Waivers” and “Releases”: What’s the Difference? Protecting the Enforceability of Swap Guaranties in Light of Dodd-Frank: What’s a Lender to Do? Instruments Under Seal: Those Words Really Can Make a Difference!